Commercial buildings and businesses need to have a different form of security than residential places have. Commercial properties have locks that are made of strong materials and which reliably prevents large robberies. That is why here at NorthWest Locksmith Spokane we have security in mind very often. 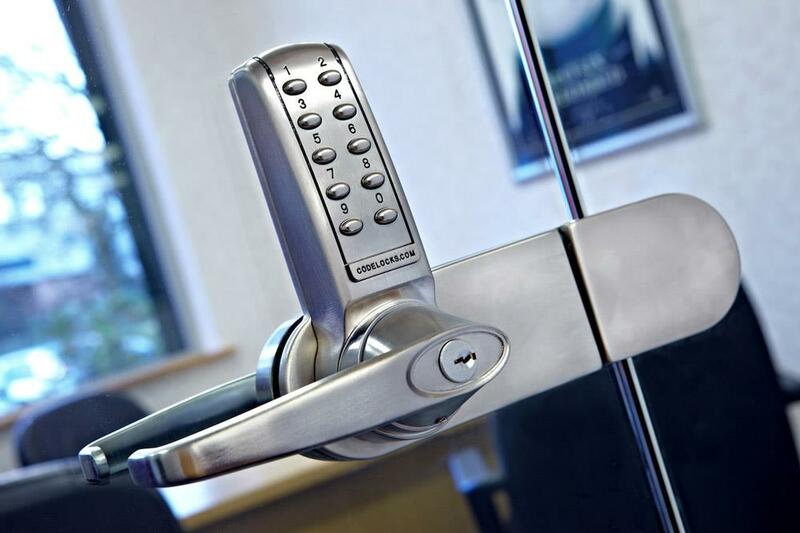 We recommend that commercial properties have electronic door locks installed as they considered high security locks. There are a variety of electronic door locks that can be chosen for your commercial property’s security and business needs. The most common electronic door locks is the electronic keypad door lock, but you will often run into Bluetooth connected door locks as well as a few biometric type locks. Early electronic door locks were always a keypad that had a specified pin number set to gain entry to the property. Keypads are still popular and they are definitely reliable, except now newer models possess a (usually light-up) touch screen panel instead of a push button. Additionally, newer electronic door lock keypads have security features such as multiple password creation in order to help prevent robbers from gaining unlawful entry to a business. Bluetooth electronic door locks are locked and unlocked easily because the electronic lock will recognize your Bluetooth ID. If you are not at the business currently and want to check up on the security of your property, you may be happy to learn that you are able to manage it from a web connection. Some types of these electronic door locks have the ability to give you notifications of when people enter or leave the premises for superior security. Additionally, the majority of electronic door locks installed by a professional commercial locksmith in Spokane allow you to create a temporary or a long term password for each employee. This way you will be able to know well who has came to work and what time they arrived, you can even customize their personal account so that the electronic door lock will not open for them if they are not supposed to be on a particular shift. Electronic door locks can also work from Radio Frequency Identification (RFID). These types of electronic door locks use a key fob or a card for the entry inside of a commercial property. With RFID technology for your electronic door lock, you may not even have to remove the key fob from your pocket to get inside. Another option of an electronic door lock available to you is the biometric entry. The electronic door lock utilizes a fingerprint or a photographic identification to open the lock of the property. All you do is program your fingerprint (or photo) and the fingerprints (or photos) of the employees that you want to also have access to the business. Once this is successfully and easily accomplished then the electronic door lock system will permit these persons entrance. Electronic door locks for commercial properties work in different ways. Some of these electronic locks open automatically upon recognizing a RFID card whereas some open when a Bluetooth ID that is programmed to it is nearby. Or, much like with the biometric system, when it unlocks the door once proof of personal physical characteristic has been ascertained. Electronic door locks are a superior form of high security locks that are a perfect match for a commercial building with a few or multiple employees coming and going throughout the day.